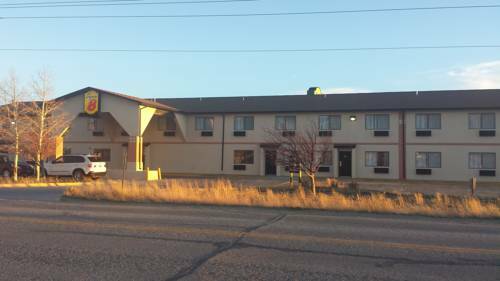 The Super 8 of Rawlins welcomes you to South-Central Wyoming. The Super 8 is conveniently located just off I-80 at exit 211. Desert, mountains, rivers, prairie, wildlife, and history surround Rawlins. Discover exotic wildlife, world-class hunting and fishing, and statewide history in Wyoming. After you have spent your day traveling and exploring our beautiful state, park your car, truck, or RV in our large secure parking lot, then let our professional and friendly staff assist you in finding the clean and comfortable room that will fit you and/or your family's needs. Enjoy expanded cable TV w/remote control featuring HBO, ESPN, Fox News and Disney. Join us in the morning for our complimentary SuperStart continental breakfast. See you along the way. One of the only places in the world where you can be sealed inside a real gas chamber for once-in-a-lifetime vacation photos. Passersby will never forget the local claim that Thomas Edison learned how to make the light bulb while spending a vacation in Rawlins. Chronicles the ill-fated Mormon project to have settlers walk halfway across America pulling their possessions in handcarts. At the Grand Encampment Museum. The second story was particularly appreciated when the snow was deep.